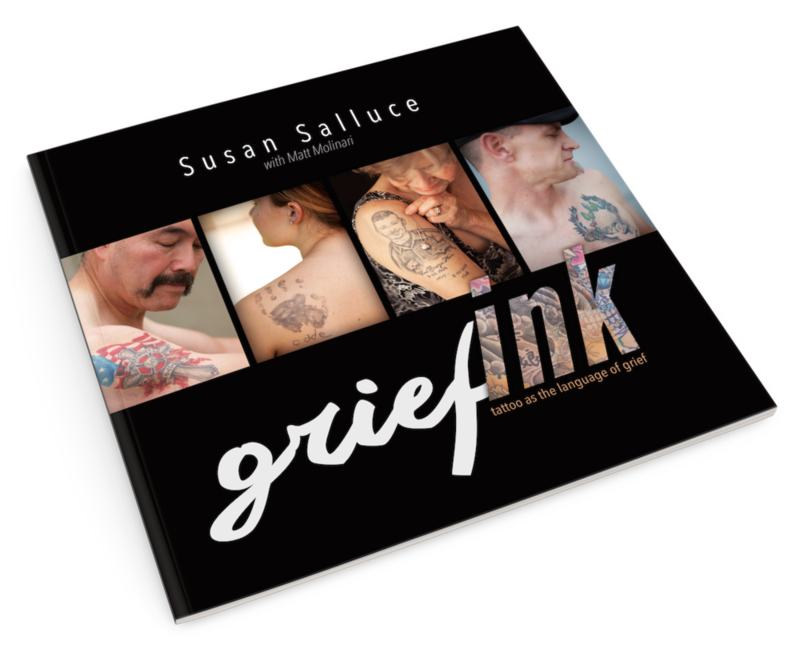 While writing my second book, GriefINK, Tattoo as the Language of Grief, I searched for a poem about mourning. I stumbled across many that were familiar, but wanted that something special that will speak to the reader’s soul. A friend recommended that I contact a young female poet in Santa Cruz, California by the name Bri Bruce. 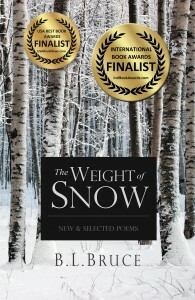 Her book of poems, The Weight of Snow, riveted me. The depth and cadence of her poetry set against the backdrop of nature solidified my choice of a poem for GriefINK. I wanted to know more about this young woman, and how her writing life has taken shape. Through the following interview, Bri shares not only her writing life, but also how her passions embody her work, creating poetry that whispers into the delicate corners of one’s heart. Bri, thank you for letting me interview you for my blog. Share a bit about yourself. I grew up in Felton and spent most of my life in and around the Santa Cruz area. I attended UC Santa Cruz to study literature and creative writing. I currently live in the Santa Cruz Mountains, so I haven’t ventured very far (my excuse always being that I wouldn’t want to live anywhere else!). Some of my hobbies include surfing, photography, and traveling. I’m an avid beachcomber and collect odds and ends, mostly old cameras and books, antique bottles, and the like. I enjoy spending time outdoors and with friends and family. At what age did you begin writing poetry? I started writing poetry when I was in junior high. It first became a way for me to express and process my emotions, and I had this consuming urge to create. I have been journaling since I was nine, and poetry seemed like a different, almost more abstract way of dealing with the trials and tribulations of adolescence. My early poetry, of course, while very personal was also disjointed, experimental, and convoluted. It wasn’t until later that my work really shifted, then began to evolve into the kind of imagistic narrative it is today. Tell us about the use of nature as your source of inspiration. I’ve always been fond of the outdoors. I was the kid that, given the choice, would spend all day outside climbing trees, rolling in the grass, getting stuck in the mud up to my knees, and coming home with bugs in my pockets. My parents both had a huge part in raising me to be nature-minded. I grew up camping, fishing, backpacking, surfing, and diving. There really wasn’t any adventure sport or outdoor activity we didn’t do. It has instilled in me a passion to seek the out of doors and immerse myself in the natural. Even at a young age, my upbringing created this profound fondness and appreciation for the natural world that is impossible for me to shake. I’m in love with it, and this shows in my work. Where do you write? Office or outdoors? Share your writing life. I would prefer to be outdoors writing longhand rather than indoors on a computer. I still write everything by hand when I’m not using a typewriter (I know, I’m old school). Strangely enough, I also enjoy writing in loud, crowded places. I’m a regular at a few coffee houses around town where I like to hunker down in a corner for a while. I also enjoy writing when I travel and find that some of my best work comes from these instances. I usually keep a travel journal, but I often gather together lines of poetry that I later work into a cohesive whole. I guess I could say that all of the processes of nature inspire my writing. Writing is in itself a process, and I believe the two are very closely connected. I love observing the happenings of the natural world, and juxtaposing them against our own lives. I feel a greater truth can be revealed, if only simple and rather instinctual or straightforward. My poems always begin as observations or narratives and evolve from there. I keep a small notebook with me at all times and write down certain words or phrases I like the sound of, or the name of a bird or a place I want to write about. Later, a large part of my writing process is stringing these all together. Give the reader a peek into your world. What is your idea of a perfect day? My idea of a perfect day to inspire my writing would be some sort of adventure to somewhere I’ve never been. New experiences always stir something in me. I like to go on these “adventures,” so whenever I get the chance to do this, I am immeasurably happy. I find I enjoy them most alone, which is something that others often find interesting. I’m extremely independent and I like exercising that independence. I would rise at dawn, watch the sunrise, and spend the better part of the morning tromping around. I would, however, want to share my perfect day with friends and family at some point, perhaps after my adventure and over a good meal. At night, I would want to sit at a desk with my typewriter and a glass (or bottle) of wine and write and listen to music, staying up late until I’m too tired to think! Drifting off into a fitful sleep full of consuming dreams is always a great way to end the day. Would you be willing to share a specific experience that inspired you to write? Sure. Last summer I spent a month alone in a small cabin in the remote forests of Northern California to devote myself to writing my novel and to work on a few collections of poetry. It was both terrifying and exhilarating. I was visited by bears on a regular basis and surrounded by wildlife. The nearest town was a 45-minute drive, and the nearest neighbors were a quarter-mile away. Among many of my experiences, one particular event comes to mind. I had just returned one evening from town to find that the porch light had attracted thousands of flying termites. Needless to say, the small cabin was infested. There wasn’t much I could do but turn the light off, and one by one pick up the termites that had managed to make it inside the cabin and put them outside. I was struck by how, all at once it seemed, they shed their wings and crawled away. In a matter of minutes, I was left with hundreds of pairs of these papery, ash-colored wings. I sat down right then and wrote a poem about it. I think this is a good example of the connection between processes of nature and the processes of a writer, the first step in the process of writing being observation. I find your poetry to be very deep…beautiful…open to interpretation and it allows for the projection of one’s own experience. At Henry Cowell State Park stood out for me, and I have chosen it for my book GriefINK. What is the back-story behind that poem? This piece was based loosely on an experience I shared with my mother on a hike through the park. My parents took me there as a kid to feed the ducks on the millponds and watch the trains. After not visiting for a while, I decided to take my mom up on her offer to go with her one day. What spurred the poem is the sobering acknowledgement of the passing of time. On that day, not only did I realize how much I had changed since I last visited (I was no longer the little girl crouching in the reeds, holding out handfuls of chicken feed to the mallards), but it was really one of the first times that I was completely taken aback by that sense of realizing that someone you love has aged. I suppose parents feel this when watching their children grow, but it was as if I hadn’t been paying attention all these years, so busy and wrapped up in my own life that seeing, actually seeing, my mother looking older to me was like waking up one morning to see your yard covered in snow. This realization of a person’s aging, and the inevitability of death, was foundational to this poem. The emotions captured in the poem are very raw and human, relatable. It was almost as if I was yearning for the years I had missed, but it was too late. I was facing for the first time the reality of a pending grief I knew would follow in the wake of my mother’s future passing. When did you know that you wanted to put your poems out to the world in the form of a book? Talk about the experience of writing The Weight of Snow. The Weight of Snowstarted out as a collection under a different title that I compiled while finishing my degree at UC Santa Cruz. For my poetry concentration, as a sort of thesis project, I was required to write a chapbook of poems. Many of these original poems ended up in more refined stages in The Weight of Snow, including the poem from which my book gets its title. The original manuscript was titled Middlestate, the commonality between all the poems being that they all took place or centered around the middle part of the State of California, i.e., where I live in Santa Cruz and the surrounding areas. While I had been published long before that (my poems were first published when I was still in middle school), the response I received from my peers and my instructors was overwhelmingly supportive, and I never looked at my writing the same after that. My instructors, namely Gary Young (Santa Cruz’s first poet laureate), played pivotal roles in supporting and encouraging me to pursue my writing further. I knew that I wanted to share my work and sending out my poems to be individually published by various journals and online publications wasn’t what I wanted. After working briefly for a small publisher in Santa Cruz where I learned a great deal more about the publishing industry, I officially started my own publishing company, building upon my graphic design and layout skills. It was through this publishing company (Black Swift Press) that I published The Weight of Snow. Since its release last February, it has garnered very positive reviews from a number of esteemed authors, including Gary Young, and is the 2014 International Book Awards Finalist in the Poetry Category, the2014 San Francisco Book Festival Honorable Mention Recipient in the Poetry Category, and is a 2014 USA Best Book Awards "Poetry" Category Finalist. There are always projects in the works and ideas floating around! Aside from the plethora of notes I have lying around for novel ideas or lines for poems, I am currently working on transcribing a journal I kept on a typewriter during a residency I took last September. It’s kind of a look into the psyche of a writer, as well as an account of my experiences of and thoughts on the craft and my journey. I’d like to take another residency to focus solely on my novel. If anyone ever has the opportunity to participate in one, I highly, highly suggest it. It’s such an enriching experience. Not only do you learn a lot about your craft, but you also get to know yourself as a writer much better. My biggest goal right now is to publish five books before I turn thirty. I have four to go, but my second, third, and fourth are almost completely mapped out. I just have to find the time to edit, design, and publish (and hopefully promote beforehand). It’s that fifth book I’ve got my sights on. I have four years to write it! What are some other aspirations that you have? My biggest passion besides writing is helping other writers in realizing their dreams of publishing their work. I bring an author’s vision to fruition, whether through designing a book cover or actually helping them publish and print their book. There is nothing more gratifying than hearing an author’s elation at holding their book in their hands or seeing it listed on Amazon. I know this feeling well, and to be able to pass that on to others is very rewarding. My biggest aspiration of all is to have not only my work but my words to have an impact, even if it’s small. I always hope others can feel through my poems and relate to them, even if it strikes a chord in them for an unrelated reason or makes them think about something else. I want my work to speak to my readers. If I’m able to achieve this, and feel satisfied with my own writing, then I’ve been successful. in his palm to show me forgiveness. the enormity of it before him.